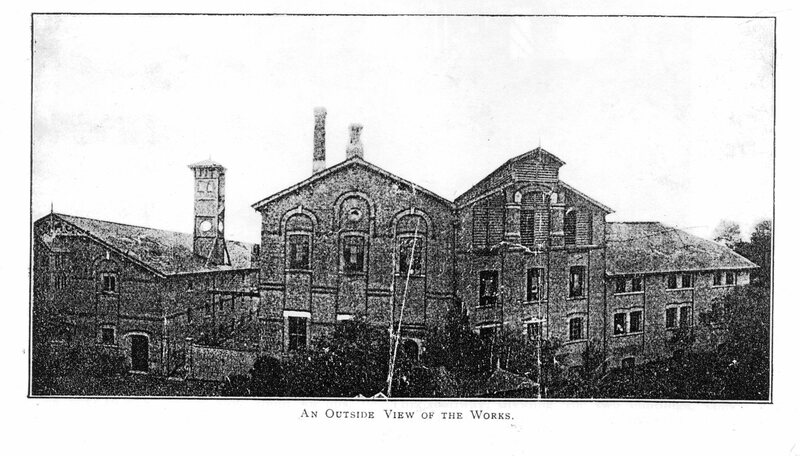 Formerly Orwell Brewery; Orwell Iron Works; Cundall's Factory; a Parachute workshop; a secretarial finishing school; Oatlands; The Grange; and Cambridge Private Hospital. With all those different names and uses over the years, the history of this secluded property is bound to have been both varied and interesting! so there was a demand for the products of the brewery right on its own doorstep. Meyers also had The White Hart in Orwell village. New Orwell was a part of the Parish of Orwell until recently, when it was transferred to Wimpole Parish so that all the property fronting the main Cambridge road was in the same parish. By 1897 the Meyer Brothers had retired and sold out to John Phillips and Joseph Edward Phillips, trading as J & J.E Phillips Ltd. 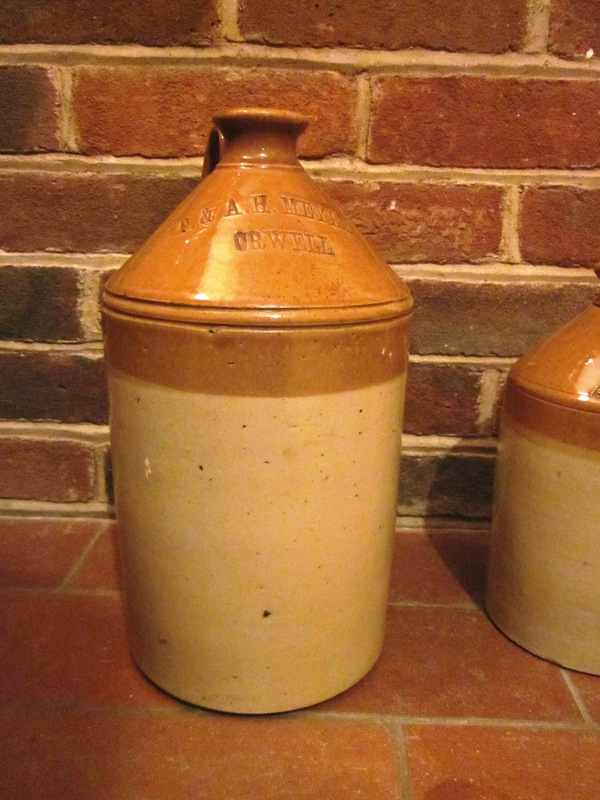 This company had numerous other premises in the area, served by their brewery in Royston. [Royston, by the way, was famous for the quality of its malt, produced from the barley grown on the light chalky soil of the hills nearby.] The Phillips family seems to have been involved in brewing in many parts of England but the full story has yet to be written, although there is a collection of the Company's old title deeds at Herts. Record Office. Stone jar from Meyers Orwell Brewery. 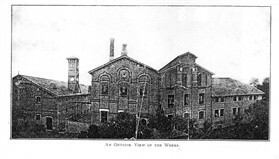 It is likely that Phillips brought to an end beer brewing in Orwell, for in 1908 the premises became The Orwell Iron Works, where the The Cundall Paper Folding Company manufactured its machines, and Phillips finally sold the property off in 1917. There is a very good contemporary account of the Cundall company here. The company moved down to this area from Shipley near Bradford, and several of the workers moved down with it. Local historian Dr Shirley Wittering has informed us that a cottage in Thriplow - Sunny Peak cottage - was built with bricks from the demolished Orwell Brewery. 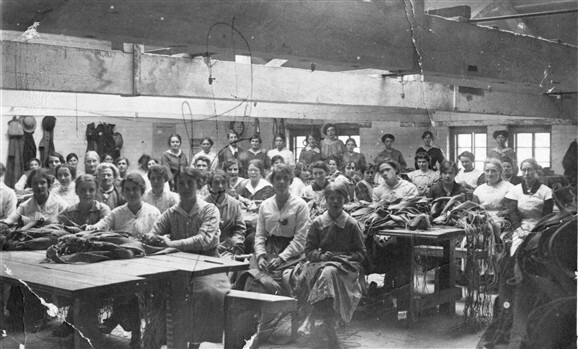 Parachute makers in the factory premises. The factory was bought from Phillips in 1917 by Charles Townley, and it was closed at the end of the war. In 1921 Mortgagees of the estate of Charles Townley put the factory up for sale (together with the houses and lands) "with the sewing machine benches" which were still in the building and together with "four villas in course of erection." It did not sell, being withdrawn at £4400, despite having the undoubted advantage of an electricity generator, powered by a 28 foot long steam boiler with a 12 foot flywheel! The house should then have had a happier history, as it was bought by Col. Briscoe, M.C., the local M.P. who lived at Longstowe Hall. The 1922 Sale Particulars indicate that this was a proper gentleman's residence, with a cottage for the chauffeur, rooms for the staff, a separate laundry, and even a telephone (number Harston 17.) Orwell did not have its own telephone exchange, but calls came through the exchange at Harston. Col. Briscoe however decided not to keep it, for there was a further auction sale in 1927. With typical agents' optimism, the particulars mention the concrete base of the former factory building, saying that it "could, if desired, be converted into a hard Tennis Court." Yet another use for this versatile piece of land? We hope that someone from the Wimpole area can now give us details of what happened to the property from 1927 until the 1960s. Steve O'Dell, Wimpole's historian, says that the house was used during the Second World War for training agents, before they were sent off to France and Belgium. "My mother and I lived at The Grange from 1965 to 1971, when she ran a finishing and secretarial school there, as well as instruction courses for the British Horse Society Instructor's qualification. All that was left of the former brewery/iron works was the shape of the brick basement, which I called 'the pit paddock.' We had heard of the brewery history, but not of the ironworks. One noteworthy mention is of the beautiful drawing of racehorses on the wall of the 'coach house' the lovely dovecote in the field. I would ride all over the scenic Cambridgeshire land on my ponies; what memories that house holds for me. I drove my first pony to Arrington." ** NEW INFORMATION HAS JUST COME IN, on January 18th 2016, REGARDING THE RACEHORSE DRAWINGS MENTIONED ABOVE ! A gentleman in Ipswich has discovered an album of photos relating to The Grange and the racehorses bred there, with details of their careers and their Orwell owners. All will be added to this page in due course. Orwell Grange was purchased in about 1971 by a Cambridge academic, Dr Pratt and his wife, who lived there until 1987 when they sold to surgeon Mr Anthony Erian, his wife Susan and their four children. Mrs Erian, a remarkably capable and energetic lady – a partner and landowner in a Norfolk farming family and a former teacher and Assistant Director of a Norfolk Sixth Form College– set about renovating the old Victorian house and its outbuildings. She replaced architectural features that former owners had removed from both the house itself and its associated cottage, and returned the overgrown land to useful pasture. 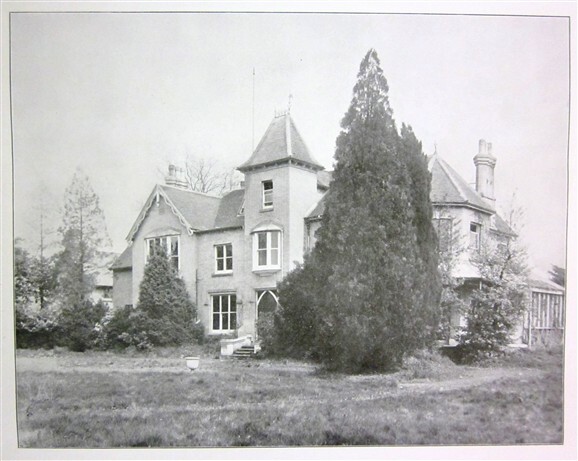 In 1988 at her husband’s request Susan began the enormous task of building and equipping a hospital within the grounds of Orwell Grange on a building plot purchased from Dr and Mrs Pratt. The Erians established the fully-registered Cambridge Private Hospital here, with Anthony as Chief Surgeon and Susan as Chief Executive and Registered Provider with the Care Quality Commission.. The Hospital opened to patients in 1994. 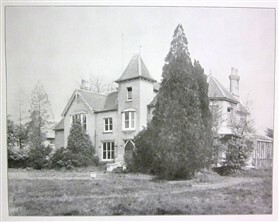 Sadly, in 2005 a decline in Susan’s health due to multiple sclerosis forced them to sell the hospital and the land surrounding it to ‘hospital tycoon’ Sean Leyden, though they retained The Grange as their family home. Sean Leyden’s business was hit by the economic slump of 2008 and the hospital went on the market. Having learned that many builders were interested in the site’s potential for residential development, Susan attended the Clarridges of London auction in November 2009 and outbid all comers, regaining control over The Grange’s surroundings. The hospital is now tenanted by The Hospital Medical Group Ltd. and operates under the name Cambridge Park Hospital, providing consultations, various procedures and post-operative care for the Group’s patients, in cosmetic, plastic and bariatric surgery. Cambridge News page on Mr. Erian. This gallery was added by David Miller on 26/11/2013.